I had, for some time, been wanting to dive into the city of Paris but had, for unconscious reasons, always put it off. I could never figure out truly why the thought of this city had both a powerful draw and a hand pushing on my chest to keep my distance but, after finally visiting this summer, I knew the reason why. It was because it was clear that I would fall headlong in love with its streets and metro and people and sounds; I haven’t fell so hard and so quickly for a place since my first tentative trips alone to London in my teens where I now live. It was with some reluctance that I admitted to myself, while wandering around Montparnasse in particular, that I would one day live here. The atmosphere, more than anything else, seems conducive to ideas, allowing and creating spaces to think. There’s a perception of Paris, rather like that of London, that it is cramped, dark and full of rude people. Aside from convincing me that it is undoubtedly the world capital of cinema, my trip also convinced me that these projections by people were beyond inaccurate. I found something in Paris that I had been, in recent months, struggling to even find in London; humanity in its spaces. Through wandering with an eye for cinema and its history, I found this humanity with ease and it further highlighted London’s increasingly surreal bent for removing people and space, building high rises that few will live in, killing its character. Central Paris on the whole has not succumb to this quite yet in an architectural sense and hunting for its cinematic history made this beautifully clear. Staying in an admittedly shabby flat in Montmartre, it made sense to explore on foot at first and see what was in wandering distance. In hindsight, the flat was mere minutes from the cafe where Jean-Pierre Jeunet filmed Amélie (2001) but this was not the Paris I wanted; I wanted an older, brisker Paris, not one with a green-filtered lens. So our wandering (and it was our for my resilient and infinitely patient girlfriend, Caroline, accompanied me) took us first to Montmartre Cemetery. It was the first of three graveyards on the trip which highlighted a rather morbid excavation of the city on my part. In Montmartre lies François Truffaut and Henri-Georges Clouzot among other creative notables. Truffaut’s grave seemed incredibly well positioned in its situating under the Rue Caulaincourt bridge; a bridge that we would come back to a number of times through getting enjoyably lost at night, but also the bridge where Antoine Doinel argues with his accomplice regarding their recently stolen typewriter in Les Quatre Cents Coups (1959). How fitting for the director to lie under a moment of such mischief, his cinema alter-ego endlessly ghosting the bridge with his lonely rebellions. On the same day, we wandered down through the more touristic part of Montmartre where they have tried, foolishly but understandably, to recreate a gift shop vision of the area’s pivotal part in the many art scenes of the fin-de-siècle. I wanted desperately to escape from this area, especially the beautifully cobbled streets near Sacré-Cœur where people jostled frantically with selfie-sticks. Escaping down the steep embankment of steps that lead to Rue Gabrielle, Caroline spotted the first appearance of a character I was in search of: Monsieur Chat. The graffiti artist and his grinning yellow cat are now synonymous with the director Chris Marker due to his 2004 film, Chats perchés. Apart from the graffiti appearing variously in the film, it seems to represent the director’s panache and wit overall. This particular chat was slightly hidden on a chimney pot of a house on Rue Drevet and, later on after a trip to Versailles, Caroline questioned why a graffitied cat made me more excited than a quite literal palace; I couldn’t quite explain it. Before our wandering ended that day, at least in terms of films, I dived into Librairie des Abbesses on Rue Yvonne-le-Tac. I concluded, after exploring a huge number of French bookshops generally, that French books are the most beautifully and subtly designed in the world. I found a particularly stunning volume of Jean-Luc Godard’s Histoire(s) Du Cinema and it took a lot of effort not to buy it. The following day was to contain wider exploring. We took the metro to Tolbiac, got lost, ended up at the Médiathèque Jean-Pierre Melville and then doubled back through town in search of a very particular house. After these minor detours we eventually arrived at Rue Brillat-Savarin. Number 49 is the house at the heart of the mystery in Michael Haneke’s 2005 masterpiece, Caché. I tried to recreate the exact shot which may or may not be filmed by the perpetrator and stalker of the film. Several people wandered by and asked curiously what we were doing. Caroline tried in vain to translate; she wasn’t quite sure either. The next stop after this was decent distance away and so we left the house to the killer of chickens and made our way to Montparnasse. 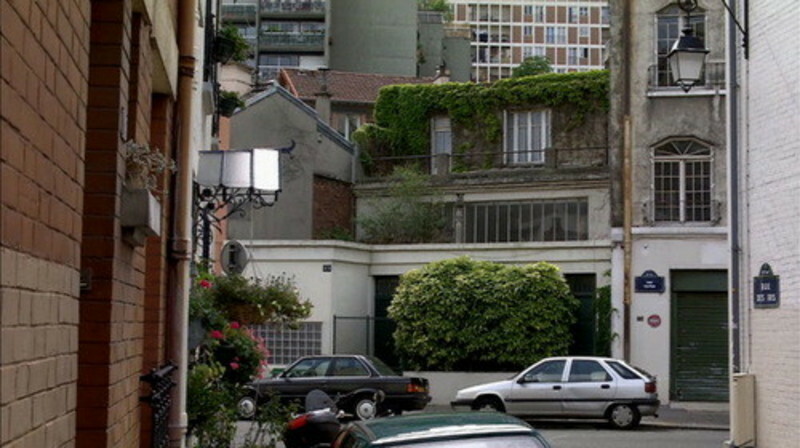 I firstly wanted to see Agnès Varda’s house and the current base of Cinè-Tamaris on Rue Daguerre. The house is bright pink and adorned with a huge heart; a more important Sacré-Cœur for me. Following this track of thought, we wandered briefly south and found Place Jacques Demy which is now a food market. Paris remembers its cinema. It occurred to me that he was buried in Montparnasse cemetery and so we then ventured north to the graveyard to find him. The map that we were given was wrong and, seemingly by chance, the spot marked as being Demy’s grave was, in fact, where Alain Resnais’ is now situated. An hour later and we had tracked down Demy’s grave and also Eric Rohmer’s though it had been a long search in the searing heat, all under the gaze of the ghastly Montparnasse Tower. Many people are buried here – Beckett, Sartre, de Beauvoir, Gainsbourg, Cortazar – but the sun was glaring and we promised to return on a future visit. The last grave we saw, however, was Jean Seberg’s and this connected to the last location to visit for the day. Just over the road from the graveyard is Rue Campagne Première where arguably Seberg’s most famous scene is filmed. The final scene from Godard’s À Bout De Souffle (1960) is shot here, including Seberg’s final dragging of her thumb across her lip. However, I wanted to recreate Jean-Paul Belmondo’s death instead and so, risking life and limb on the now much busier road, Caroline snapped me idiotically pretending to have been shot in the back. We had coffee afterwards in a nearby cafe and I couldn’t help but be swept away whilst looking at her in the afternoon Parisian sun as she drank an espresso. Dinner was on me that evening. The next morning, the sun was out again and the trail of Monsieur Chat was to be followed. Taking the metro to Alexandre Dumas (and not without spotting that there is actually a metro station named after Delphine Seyrig), we wandered to Rue Courat where Chris Marker’s studio and house was. From the recent publication of Remembering Chris Marker, it’s obvious that little has changed inside or outside of the house since his death. All except the wall which M. Chat has since adorned with a beautiful graffiti tribute to that most elusive of cinematic owls. I wanted to get a picture with it because it was the most important pilgrimage for me; Marker’s work meaning more to me now than that of most other filmmakers. After a brief farewell to a most excellent pair of cats, we wandered to the nearby Père Lachaise cemetery. I was on autopilot due to a lack of coffee so failed to see that George Méliès was buried there, instead simply wandering in between eating, finding Proust, Wilde and the many others who now reside there. To make up for it, we later travelled to Bercy and to the Cinémathèque Française where I became even more childlike in their museum. Sadly, its main draw – the head of Norman Bates’ mother from Hitchcock’s Psycho (1960) – was away for restoration, but there was a wealth of other attractions: the original Maria from Fritz Lang’s Metropolis (1927), designs from films by Murnau, Chaplin and Wiene and, most importantly, a variety of Méliès memorabilia including a huge portrait of the man. However, my favourite artefact was a cartoonish portrait of Sergei Eisenstein which seemed to summarise him more than most books have been able to. After enjoying the building for quite some time, we eventually wandered to the last filmic destination, a strange and amusing exhibition of recent actor portraits. Walking past Rue Jean Renoir, we came to the shopping district where it was on display. Alongside portraits of Marion Cotillard and Monica Bellucci sat a proud portrait of Hedwig the owl; no one can deny the quiet sarcasm of French humour.